This weekend well known local angling journalist and pursuer of anything with fins, Wayne Thomas, visited Exe Valley Fishery to spend some time talking fishing, casting a fly and behind the lens of his camera. Very kindly he has agreed that we may reproduce the article he wrote following his visit which first appeared on Wayne's excellent North Devon Angling News website. Just before I leave you to sit back and enjoy Waynes wonderful images and text, which I am sure will have you reaching for the tackle, please note that Exe Valley Fishery is open for business as usual following my recent decision to join the team at Farlows based in central London. I will work behind the scenes to maintain the sport as always with my wife Sue taking on the day to day management. This week we have received several calls and messages while also hearing rumours that Exe Valley has closed down. As can be seen from the following words & pictures ... this is very much not the case! The salmon season over it was time to head off for a days Still-water Trout Fishing and hopefully put a bend in the rod. I was joining Wistlandpound Fly Fishing Club to compete in their Rogers And Guard Shield Competition at Exe Valley Fishery. I can well remember Gordon Rogers who was one of the club members the shield was named after. Gordon was a Fishery Bailiff with the River Authorities of the 1970’s and a real character who many local anglers will have fond memories of. The competition was due to start at 10:00am and I intended to get there in plenty of time so I set off just before 8.00am for an enjoyable drive across Exmoor. 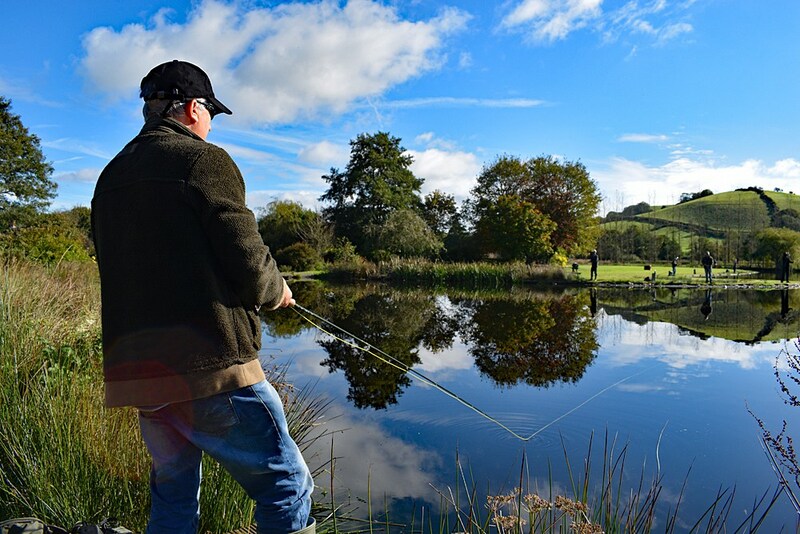 Exe Valley Fishery is located just outside the boundaries of the stunning Exmoor National Park - image courtesy of Wayne Thomas. A good days fishing is more than just a day casting a line it is often all about the entire day. As I negotiated the narrow lanes up onto the moor mist lay in the valleys as the sun climbed higher into a bright blue sky. I noted several keen photographers out and about catching the morning light. On the high moor I glimpsed red deer blending into the bracken; the autumn stag were undoubtedly bellowing their challenge across the open moor. It was an awesome morning to be going fishing. I arrived at Exe Valley to find that one or two members were already raring to start. I grabbed a coffee and began chatting with fishery manager Nick Hart and his wife Sue. Nick is embarking upon a new adventure joining www.farlows.co.uk in Pall Mall’ London. I have fished with Nick many times over the years and share his enthusiasm for fishing. After over an hour of chatting I decided I had better head out and do a bit of fishing. I had after all paid £35.00 for a three fish ticket + the option to release three trout, as part of the fishery’s innovative ticket choice system. The sun was shining down on a mirror calm lake that was surrounded by a dozen or so anglers. I tied on a small gold head pheasant tail nymph and a black buzzer on the dropper. Trout were active all over the lake and a couple of members had already caught their three fish bags so I was on a catch up mission. After a few casts I had had no takes. With fish showing all over the surface it was obvious that the trout were near the surface. I concluded that a lighter fly would be more likely to succeed and tied on a lightly dressed cruncher pattern. First cast with this fly and the line twitched on the retrieve, the hook was set and the water erupted as a rainbow trout leapt from the water before putting a serious bend in the rod and stripping several yards of line from the reel. Nick took a stroll around the lake and captured action with the next trout I hooked’ a handsome rainbow of close to 3lb 8oz. It wasn’t long before I had completed my three fish bag that was my competition entry for the day. I took the opportunity to have a walk around the lake and preserve a few memories of the day with my camera. I was surprised that not everyone had bagged up whilst the trout were in an obliging mood. The introduction of catch and release during the cooler months at Exe Valley has on the whole been welcomed by anglers who can choose various options combining catch and release and catch and despatch. The fishery has imposed strict rules to ensure that catch and release works as well as possible. Anglers must use barb-less hooks and rubber meshed nets. Trout should not be taken out of the water unless a quick picture is required as a memento of a special fish. I decided to pay a quick visit to the site shop and buy a couple of barb-less flies and borrow a landing net with a rubber mesh. I returned to the lake with a fly known as an owl on the point. The number of trout rising had now decreased but a few were still showing and it was these fish I targeted. Watching carefully I attempted to drop the fly in front of cruising trout twitching it soon after letting it settle. Twenty minutes later I had returned two more hard fighting trout. Wayne with a bright Exe Valley Rainbow - caught using a dry fly in October! It was now time to head back and weigh in my fish with fellow club members. My three pulled the scales to 9lb and secured me the honour of winning the Rogers and Guard Shield. It was now time for a coffee and a further chat with Nick about fishing past, present and future. One topic we discussed was the seasons of trout fishing. These small Stillwater trout fisheries are undoubtedly more productive during the cooler months. We both concurred that that there is value in revising the traditional trout fishing seasons. The trout season traditionally casts off in the spring and this is I suspect a follow on from the days before Stillwater trout fishing grew in popularity and wild fish were the target. A closed season during the winter months gave the fish protection during spawning time. This made perfect sense in rivers and where wild fish spawned. Modern day trout fishing on still waters is generally for triploid trout that are sterile. During the cooler months the trout are more active and fight far harder. It perhaps makes sense to close many trout fisheries during July and August when weed growth is more prolific and water temperatures high. The English climate is not too severe and with modern clothing comfort is ensured. We also discussed trout fishing tactics the importance of observing the fish to decide fly patterns and the idiosyncrasies of anglers. We could I am sure have talked for many hours. That’s part of angling’s joy for it is the trout and nature that make the rules that we anglers take great joy in analyzing. Before heading home I had a few more casts on the lake relishing the opportunity for one more catch and release rainbow before I left for home. It turned out to be handsome trout of close to 4lb. It will be business as usual at Exe Valley for the foreseeable future with Sue taking care of the day to running of the lake while Nick embarks upon a new venture working with one of the countries most reputable fishing tackle companies. Exe Valley Fishery is managed by Sue Hart with assistance from new Farlows fishing manager Nick Hart.